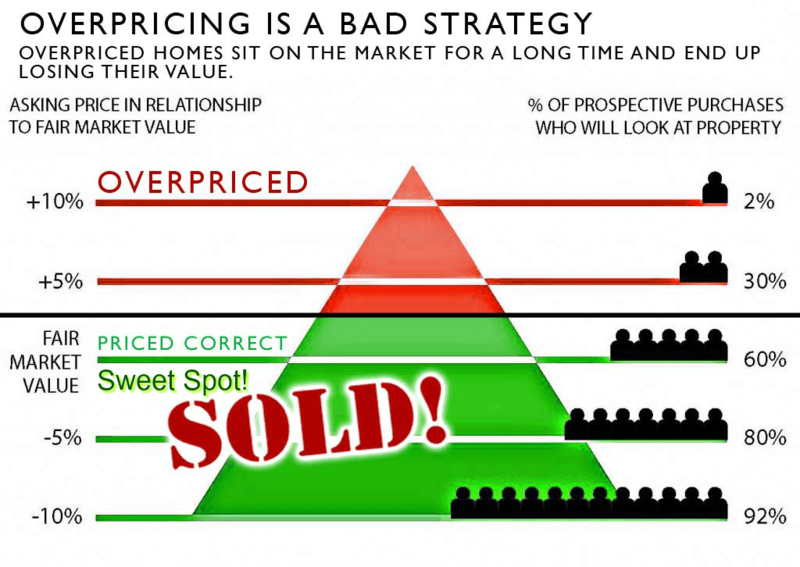 When Your Home Selling Price is too High, Beware! If you’re like many sellers you’ll probably want to start your home selling price at a higher price so there’s room to negotiate down. This is the single biggest mistake sellers make and in this article we’ll tell you why. Improper pricing on any item, regardless if its real estate can cause unneeded delays in the sale of the item thus creating a seller to “chase the market”. Starting your home selling price to high is a tactic many sellers think is the best way to do things, after all its the negotiation game right? Definitely DO NOT get caught in this trap. Proper pricing for real estate is critical and if you’re selling your home there’s probably a reason why you’re selling it in the first place and don’t necessarily want to keep it on the market any longer than you have to. When evaluating pricing, first look at what other similar homes have sold for in the area. When I say similar I specifically mean the condition, layout, square footage and bedroom and bathroom counts. You’ll want to look at all the homes that are currently listed, in contract and have sold within the last 6 months. Once you have this information then you’ll be able to start thinking about price. Just because your neighbor Jim sold his house for $500,000 doesn’t mean your home is worth that. Hiring a real estate agent will cost you money in commission, (by the way commissions are negotiable) but the money you save in lost time chasing the market on improper pricing may easily compensate for that and possibly more once your home is sold at its actual value. For instance what if Jim’s house didn’t have a pool and was 500 square foot smaller or even in worse condition than yours, the home you may have sold for $500,000 would’ve sold for $550,000 or even maybe $600,000 had you hired a professional. You owe it to yourself to hire the right person for the job, besides making sure your home is listed for the proper price you also want to make sure your liability is limited as much as possible. There’s a ton of paperwork involved with selling a home and you want to make sure you’ve got it all in order or you may end up in court. Let’s fast forward just a bit, regardless if you decide to use an agent or not it’s critical to have your pricing in check. Once you have a buyer on your home they’ll likely have an appraisal done and if you’re pricing is not in order your deal maybe trashed. As a seller in this predicament, you can attempt to renegotiate pricing but at that point the ball is in the buyers court and the seller doesn’t have much to stand on unless they’re ok with the deal being cancelled. Sellers Tip: You can download a copy of our free eBook, 7 Steps to Successful Selling which provides the most detailed information on the importance of proper pricing. Overpricing your home when you list it is a sure way to draw out the sale of your home for the longest time possible. If you do get an offer you will certainly run the risk of the deal falling apart. Do your due diligence as a seller, know your pricing and who your competition is and what they’re doing. This will keep you ahead of the game and ultimately sell your home in the best time possible. Avoid at all costs chasing the market, be ahead of the market at all times. For more information on the importance of an accurate home selling price, please contact us or leave a comment below. We’d appreciate the opportunity to assist you!